A moving story of one child’s life in a conflict zone. 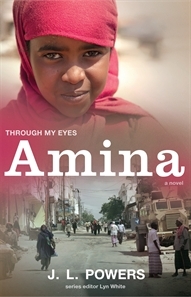 Amina lives on the edges of Mogadishu. Her family’s house has been damaged in Somalia’s long civil war, but they continue to live there, reluctant to leave their home. Amina’s world is shattered when government forces come to arrest her father because his art has been officially censored, deemed too political. Then rebel forces kidnap Amina’s brother, forcing him to become a soldier in Somalia’s brutal ongoing war. Although her mother and grandmother are still with her, Amina feels vulnerable and abandoned. Secretly, she begins to create her own artwork in the streets and the derelict buildings to give herself a sense of hope and to let out the burden of her heart. Her artwork explodes into Mogadishu’s underground world, providing a voice for people all over the city who hope for a better, more secure future. “This touching story brings home vividly the dangers of creating art that seeks to be true? and all the more so? during a vicious civil war, interwoven with religious extremism. Thankfully, Amina’s teenage curiosity and courage also signal hope.” – Beverley Naidoo, author of Carnegie Medal Winner The Other Side of Truth.